For an upcoming project I’ve been researching the first issues of art magazines produced in the San Francisco Bay Area. The SF Bay Area hasn’t been able to sustain a contemporary arts journal for a variety of reasons, but there have been at least a dozen attempts. With the help of my brave and talented intern Simon Jolly, I’ll be scanning and presenting a number of these journals in June in conjunction with the SFAC Gallery’s 40th Anniversary. We’ll also be running OCR (Optical Character Recognition) software on all the scans which makes the downloadable pdfs word-searchable, a helpful aid to research. I’m starting with ArtWeek, which has been on my mind since it ceased printing last year. While it’s never been a specifically San Francisco oriented magazine, and hasn’t been a progressively contemporary journal in well over a decade, many notable writers and curators from the Bay Area have contributed to its four decades in print. I love your idea of optically scanning the text for future searches… What a great way to keep the archived info flowing and circulating! I’m glad to see what you’re doing with this project, and find the idea of optical scanning of text an exciting possibility. Although Artweek was not focused solely on San Francisco, the Bay Area was the focal point for much of the magazine’s history, and without access to those archives, much of the rich artistic history of this area will remain hidden. Thanks! I’m doing research on Dennis Oppenheim, and I’m unable to locate copies of Artweek from the early 1970s anywhere in a New York library, where I live. By any chance, do you have these issues and pages scanned? If so, could you somehow post or send them? “Body Works at MOCA,” Artweek 1, no. 34 (October 10, 1970): 2. 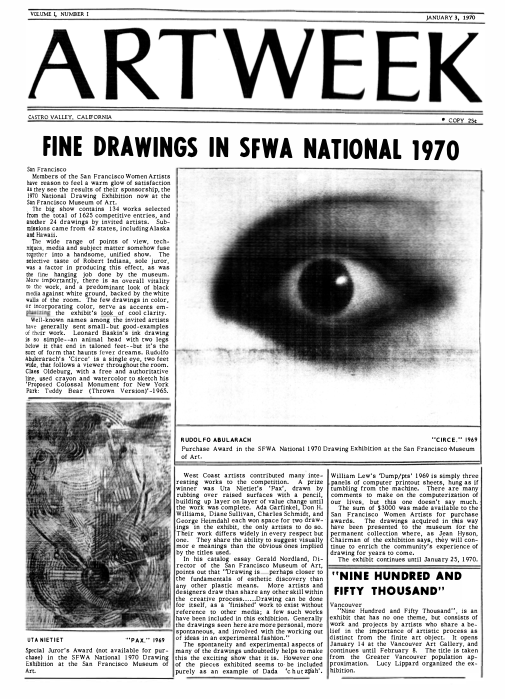 Cecile N. McCann, “Dennis Oppenheim: Conceptualist,” Artweek, November 21, 1970, 2. Another obscure but amazing document of the times (late 1960’s up through 1979) is a book on performance art in the San Francisco bay area printed in 1980. I loaned it out to someone several years ago (Meredith Tromble maybe/maybe not???) and have never seen another copy. The cover was a photograph of Terry Fox doing his “Corner Piece.” As I recall. it was quite an interesting a bit of scholarship and art history. Wish I knew what it was called. Performance Anthology: Source Book for a Decade of California Performance. Edited by Carl E. Loeffler and Darlene Tong. San Francisco, CA: Contemporary Arts Press, 1980. I am doing research on Los Angeles artist, Robert Marks, and I am looking for critical reviews of his work in Artweek from May 1971. Have the May 1971 issues been scanned and available on-line? So glad you’re doing this. I was closely associated with Uta Nietiet who I notice is tagged here, as well as a few others who may show up in your research. There has been so little on line for this subject and the artists. Your work will be greatly appreciated by me and many others. I clicked the link above for the PDF for Art Week Vol. 1 No. 1 and it is apparently no longer available. Is there a chance it is now at another address? Cecile McCann, in the early years of ARTWEEK, would publish and promote what mainstream art mags (and local newspapers) wouldn’t touch or avoided. While typically advertising future shows and reviewing past shows, she was also part of the action in many ways, supportive of artist-driven events and new ideas in the early 70s when it was needed. For mail artists and conceptual/performance oriented artists, ARTWEEK was like a statewide town crier, getting word out about events and projects that might not have been noticed until well after the action. California artists of my era especially owe Cecile a periodic posthumous note of gratitude, even while knowing that she sometimes was supporting stuff about which few people outside the underground understood or even knew existed. ARTWEEK was, in fact, a very early art zine, a forerunner of artist-driven publications. We’ve been around the sun over 12 times since this blog post. The link does not work and The Big Google is not finding anything like that. The likelihood that you are still on the beat for this blog is low and the chance the estate of the owner of ARTWEEK may not have approved the scan and publish project is high. If anybody reading this knows where this project is going I would love to know. P.S. Sorry for the mangled HTML in my above comment. The Post here has a link above that says “Go to Download Page for ArtWeek Vol. 1 No. 1” which does not work. I’m just hoping the PDF exists somewhere else on this site or elsewhere. Anyone have an idea on this. Thank you for this. It was great finding this issue. I couldn’t even find it at the National Gallery of Art. Hi Joseph, is this a project that continued? I’m looking for issues of Artweek from the 1970s and they’re hard to come by! I am looking for Artweek articles written by Fred Martin (I am an artist and a researcher on contemporary artists as shamans). If anyone can tell me how to find old issues, please let me know. Denita Benyshek, PhD/MA Psychology, MFA/BFA art. I’m volunteering as an art docent with LACMA in the public schools. I have sa Studio Art degree and Art History minor from UC Irvine. I took and Art History class from the editor of ArtWeek for 2 consecutive years from the editor of ArtWeek in 1977-1979. I don’t remember his name. Does anyone know who he was? I’d like to go back and read his editorials so I give students the full experience of how Artists were influenced as he gave to me. I have a collection of Artweek Magazine back issues from the early 1970’s (when I was assistant editor). If anyone here is interested let me know. I can’t seem to access the Joseph del Pesco’s project site to see if they have already been archived.